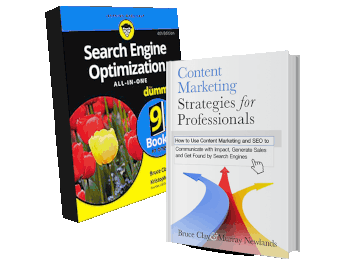 Whether you know it or not, people are using search engines to look for your brand’s Facebook Page(s), so what Google returns in response should – like any other optimized SERP listing – ideally affirm your brand authority, encourage clicks, direct traffic to the places where you want more traffic, and spread brand awareness. 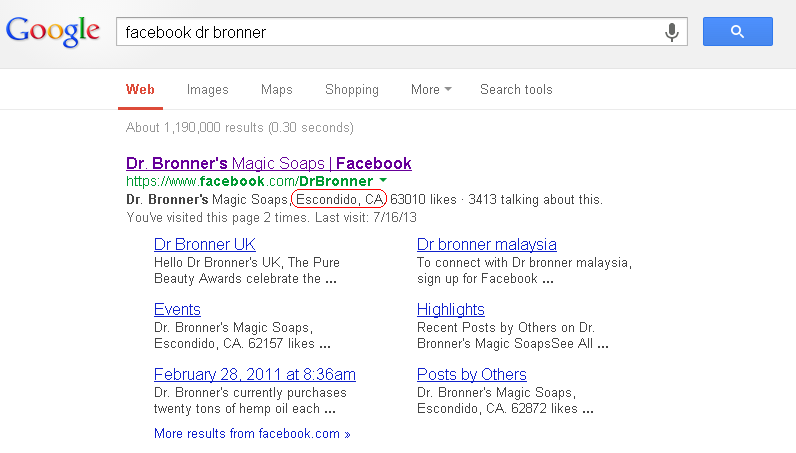 Whether it’s 10 people or 200, people are using search engines to find your Facebook Page(s). 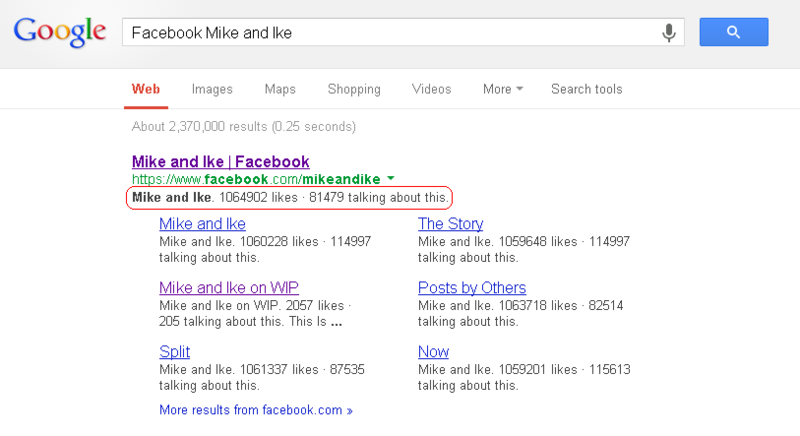 So, how do you optimize your Facebook Page for search? The trick is to analyze what public-facing Facebook content Google shows when, how this content is displayed in SERP results, and what influences determine rank, and then base your Facebook and content optimization strategy on your findings. Even for a puzzle-obsessed marketing writer (me) that sounds like a tall order. That said, because I am puzzle obsessed and possibly a bit of a masochist, this week I took it upon myself to investigate two dozen Facebook SERP listings and their correlating Facebook Pages to try to uncover patterns worth strategizing around. After a few strategy crushing monkey wrenches and one or two “what does this all mean? 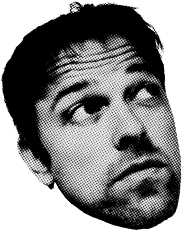 !” existential tantrums, I’ve settled on these four tangible takeaways to help guide your Facebook optimization strategy. My hope is that these four takeaways make you aware that Google is looking at your public-facing Facebook content, that People are using search engines to look for your brand on Facebook, and that – even though you can’t control the Meta HTML or Schema of your Facebook Page – you walk away feeling like there are some things you can do in Facebook to influence what your SERP snippets look like. 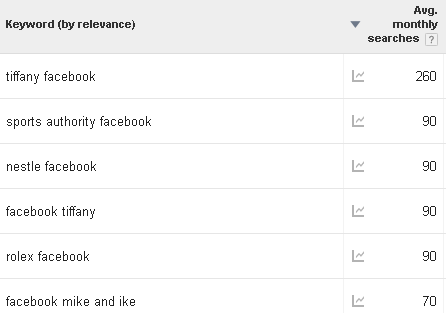 First and foremost, in 80% of the “Facebook [brand]” search queries I performed I saw Google include the number of likes, “people talking about this,” and, when applicable, checkins, in the Meta Description field. These numbers carry a big punch in the first impression department. 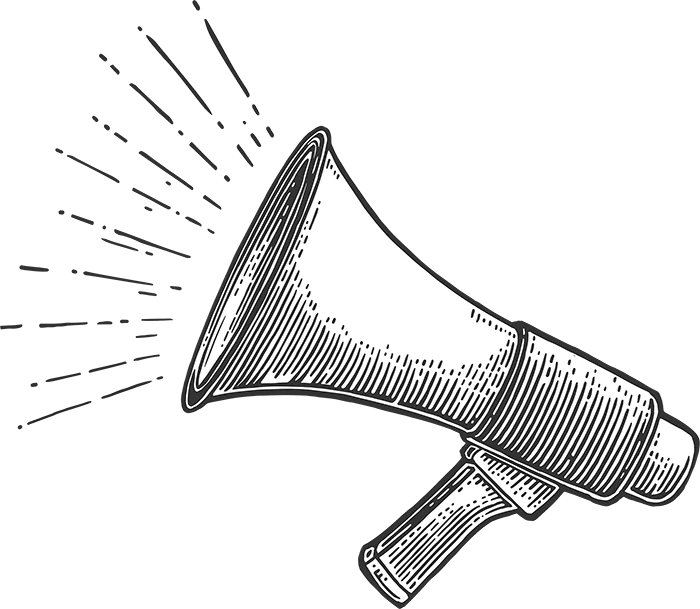 If your numbers are high (especially your “people talking about this number”) it will help positively convey and affirm your authority in the industry, as well as your level of dedication to community participation. 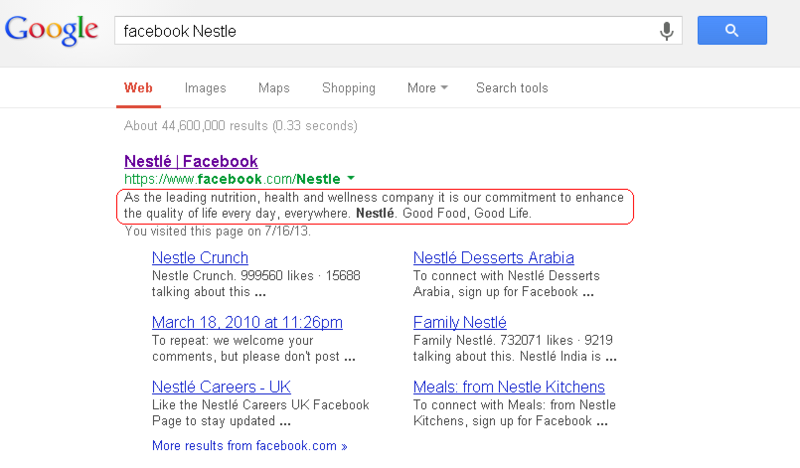 Google clusters related results in the search engine results pages. 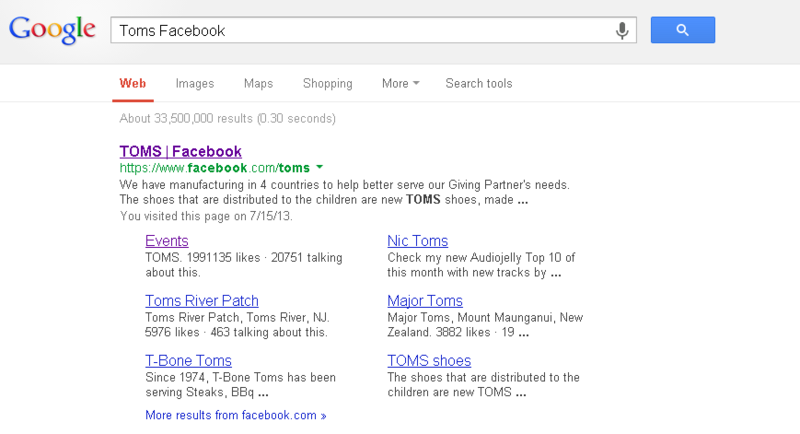 That means when someone does a search for “Facebook Toms” they are going to see results for TOMS shoes, Tom’s of Maine, Tom’s River Patch (in Toms River, New Jersey), and any “Toms” that have created a brand Page for themselves. Since Google clusters related results, one of these brands is going to be on top, and two to six of the others (the number of clustered links varies from search to search) are going to be nested underneath the main entry. You want to be the top result. Since position number one exudes authority over the other brands, to earn this position you need to build up your authority by growing your Page-level likes (i.e., the number of people who like your Page) as well as your “number of people talking about this” Page engagement (i.e., the number of people who are interacting with your Page, and talking about your brand in their Timelines). 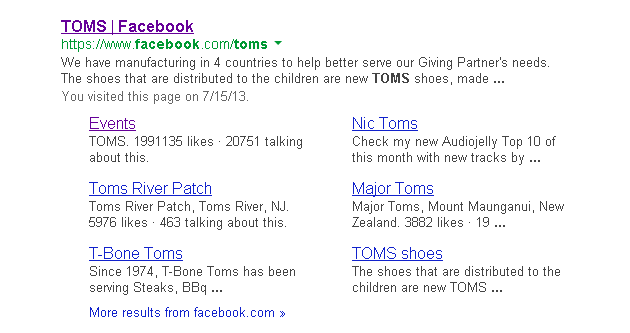 To put this into context, in the above example TOMS shoes – the top listed entry – has 1,992,487 likes and 29,238 “people talking about this” at the time of publication, and Tom’s of Maine – one of the clustered results – has only 420,670 likes and 2,899 people talking about this. In addition to boosting perceived brand authority, there are a couple other benefits to being the top result. For one, the number one spot receives a more visually prominent Meta Title with search query words highlighted in bold, the inclusion of a URL (also with search query words highlighted in bold), and ~160 characters for the Description. While, on the other hand, the six clustered results get no bold search query terms, a finer font treatment for the Meta Title, and only ~58-65 characters for the Description field. Another nuanced benefit of being the top spot is that, because of the way Google clusters the results across the board, the clustered results listed below the main result may actually be misunderstood as sublinks of the main SERP listing. For example, see below the clustered results for the Joe’s Crab Shack website and the clustered results returned for the “Facebook Toms” query. The main “Joe’s Crab Shack” search is showing four clustered links from the Joe’s Crab Shack website, while the “Toms Facebook” results are showing four clustered links for Facebook.com, including three links that represent separate properties having nothing to do with the main link, TOMS shoes. This really isn’t ideal for anyone as the property that has earned the number one position doesn’t want people to mistake an only slightly related clustered Page as part of their brand property, and the little guy who got stuck in the cluster doesn’t want to be viewed as a subpage or application of the main entry. The solution? 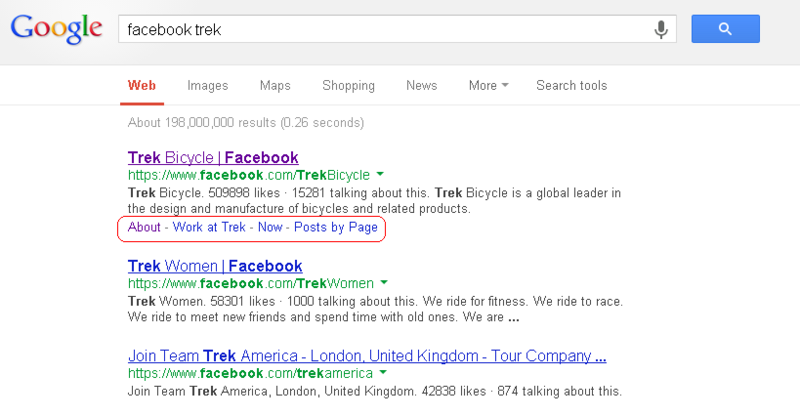 Invest time in your Facebook Page, focus on your engagement, get your numbers up, and earn the top SERP spot. 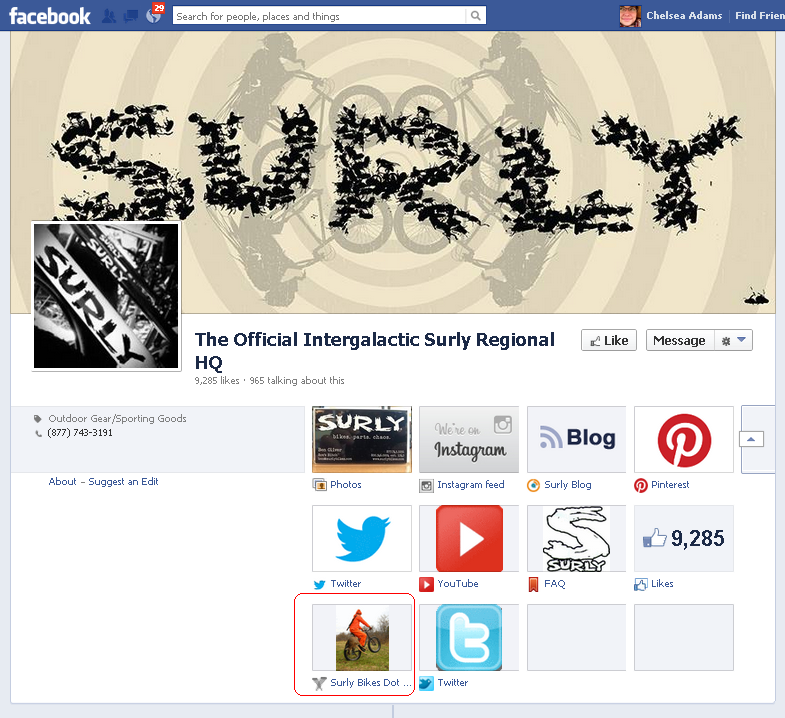 Then, include apps on your Facebook page to fill more of the clustered spots with your own content. Like all Meta Descriptions, regardless of what language you want the SERP to show, Google basically chooses what information will be included in the Description area based on what they deem to be most relevant to the search query. As mentioned above, in nearly ever case I could find Google includes first and foremost the Page’s stat numbers (Page-level likes, engagement, and checkins) in the Meta Description field. So, if 60% of the time I found Google pulling from the information a brand provides in their About section, where are they crawling the rest of the time? The other 40% of the time I found two things happening: either, as mentioned, no text was provided in addition to the Page-level stat numbers (24% of the time), or in 16% of the test SERP results the Meta Description field was pulling in a post from the Page’s Timeline. I blame this 40% curve ball on Google’s desire to deliver the text that they think the searcher will find the most useful and relevant. That said, I’m not convinced there is a way for you to influence which specific posts Google shows in the SERPs, but I am positive you can narrow down what Google has to pick from by being selective about what content you allow on your Timeline. Undoubtedly the posts that are shown in the search results pages are selected because of their engagement numbers*, so I recommend staying focused on social media best practices and content creation that encourages community conversation and sharing. *Note: When I say posts are selected “based on their engagement numbers” I mean that a post that has a lot of engagement qualifies for representation, whereas a post that has no engagement doesn’t stand a chance. I do not mean that engagement guarantees your post will show up, and I also don’t guarantee your post with the most engagement will show up. In my testing I came across a couple cases where the post represented in the SERPs has stellar engagement, but the Page Timeline actually shows one or two posts that have even better engagement. I don’t know why Google picks one post over another, but I do know it’s picking from the crème de la crème of your posts. Interestingly enough, I couldn’t find the post with the exact language described in the Meta Description, but I did find several other posts just like it (including the post shown above). 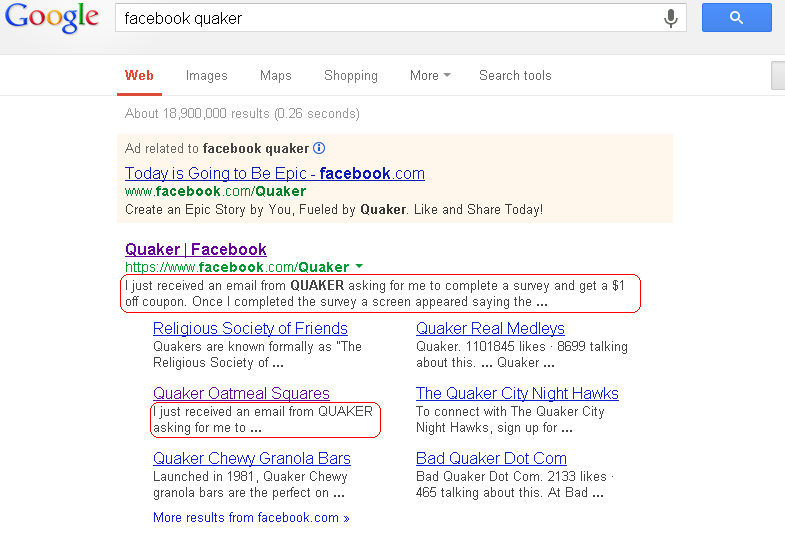 My guess is that Quaker deleted the post that is indexed and Google is still showing the post as part of an indexing delay. I feel like asking an SEO if they’d like more links above the fold on page one of the search results pages is like asking, well, anyone, if they’d like a million dollars. What? Heck yes I want a million dollars! What fool wouldn’t want a million dollars?? When it comes to optimizing the way your Facebook content shows in SERPs, you have a great opportunity with Facebook apps. In addition to fundamentally making your Facebook pages more engaging – which will contribute to your SERP rank and perceived brand authority (number one on this list) – Google will often index and include links to your apps in search results which gives you more opportunity to drive and direct traffic. A) Apps are a great opportunity to guide traffic and get people into deeper parts of your Facebook Page where they are more likely to respond to a call to action. For example, if your SERP results aren’t clustered, sometimes Google will add four sublinks to the number one SERP result. If the Facebook Page in the number one spot doesn’t have any apps, the links will lead to generic parts of your Page like “About” “Posts by Page” “Posts by Others” and “Highlights” (which just goes to the Timeline from what I can tell). On the other hand, if your page has Facebook apps installed the generic links will be overwritten with links to your apps. This is a great way to direct traffic and get links to four of your most targeted calls to action into the top of the SERPs. 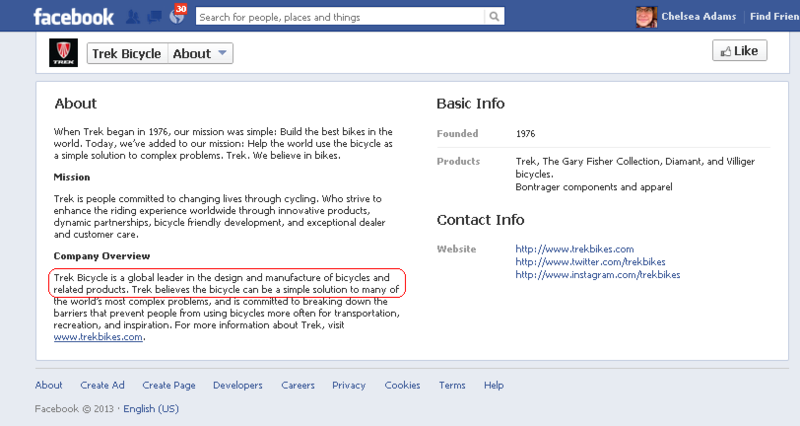 In the below example bicycle manufacture Surly created an app called “Surly dot com” that literally redirects people to the Surly.com website when clicked. I love this. If you want visits to your website, this is a really smart way to take a lead (someone who is interested in your Facebook page) and get them to a purchasing place (your website). B) If the SERP results are clustered, having apps that are picked up by Google means your brand physically takes up more space at the top of the SERP page, which can emphasize your authority in the space. 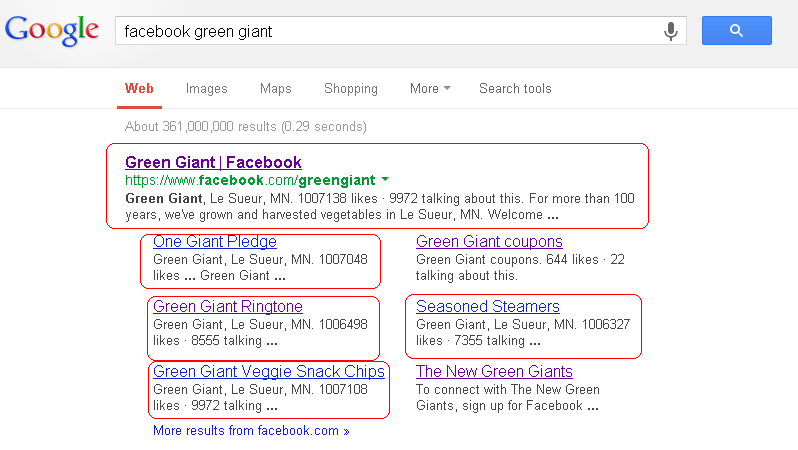 In this case the Green Giant has an active Facebook presence with many active apps, so we are seeing five links to Green Giant properties within the first entry. Put another way, that’s five opportunities to drive traffic to your Facebook Page, and four opportunities to drive traffic past your Timeline into even deeper pages. C) More links for you in the top 10 also means less links for your competition in the top 10. 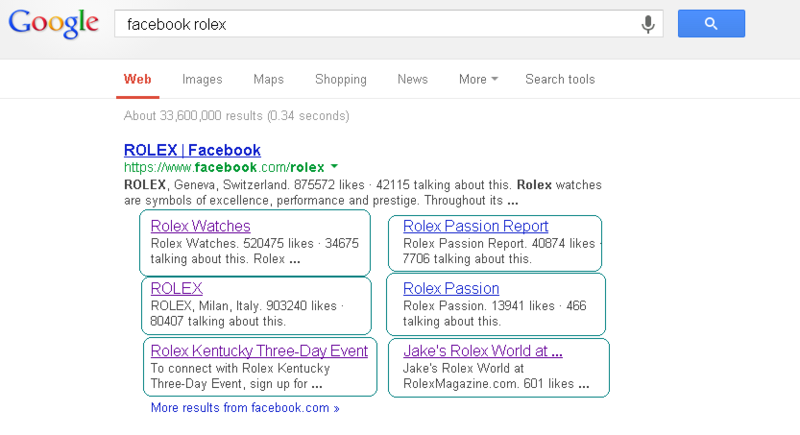 As the main Facebook Page with the most engagement the official Rolex brand Page has the top spot, but then we see six links to external pages that are in no way affiliated with the main Rolex brand Page. That’s six opportunities for people to get confused and think one of these other pages is a part of the official Rolex Page and six opportunities for traffic to go to someone else’s Page and not yours (assuming you are, in this case, Rolex). Rolex does have a “House Rules” app, but the app doesn’t get enough engagement to show up within the first five SERP pages. The moral of the story: Build thoughtful apps that represent your brand, present opportunities for action, and inspire engagement. In a nutshell, the topic of how social media affects SEO is a real bear. Seriously. It’s changing all the time and Google — the kibosher of all nerd conspiracy theory wars – isn’t speaking up to confirm or deny very much; especially when it comes to Facebook. 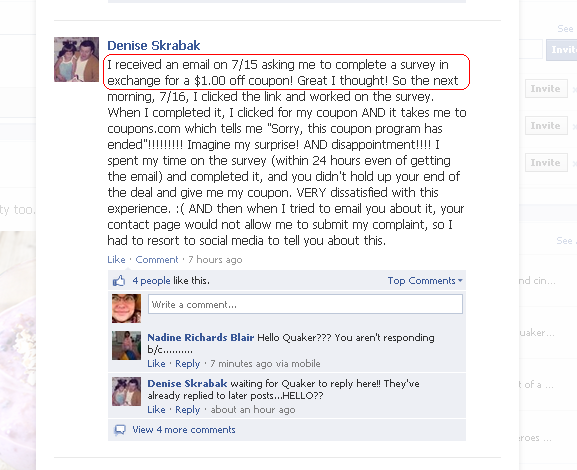 Accordingly, as my final thoughts on Facebook SERP optimization I wanted to reiterate that this test involved a small sample group (25 Facebook pages) and that there is an unavoidable amount of Google algorithm randomness in all of this. In other words, while I think these observations can serve to make you more aware of the possibilities (and lack of possibilities) when it comes to optimizing the presence of your Facebook content for SERP representation, I do not think these observations are statistically significant, and, as such, I don’t think they should be considered absolute truths that can be consistently counted on. So, was reading this a waste of your time? No! There is a lot to be learned from observing patterns in randomness, all these scenarios really happened, and I think that you (the SEO, the Marketing Manager, the Social Media Manager), can use this knowledge as a tool to help you be more proactive and search-minded when you are strategizing your social media efforts. 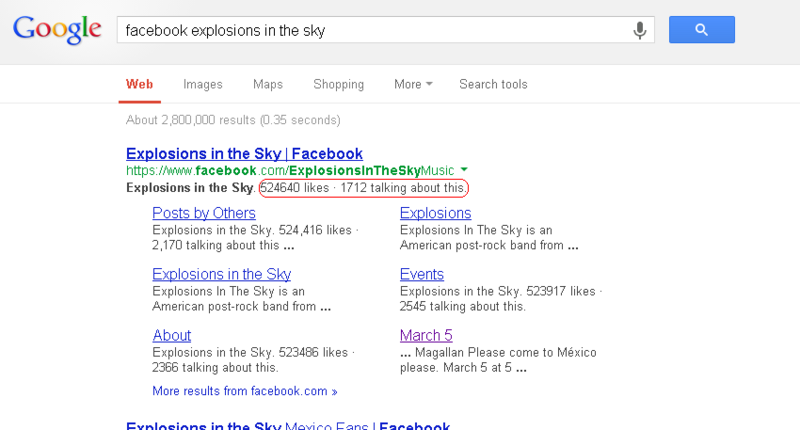 I dont show in Google when my keywords are used. 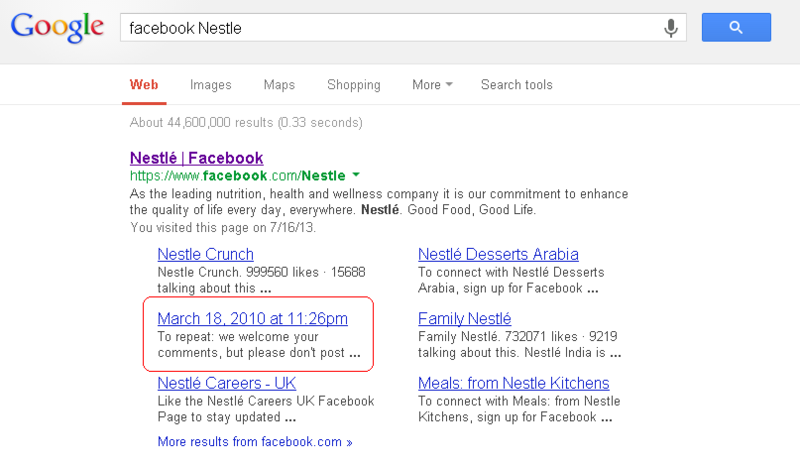 There are a number of reasons why you may not be showing up in Google when your target keywords are searched. First you need to make sure you’re using the right keywords and you need to check the competitive space to makes sure you have a fighting chance to rank for those keywords. If you haven’t already, read: How to do keyword research(http://bit.ly/15BV0F9). You also have to make sure you’re including your keyword phrases in the right places on your page. 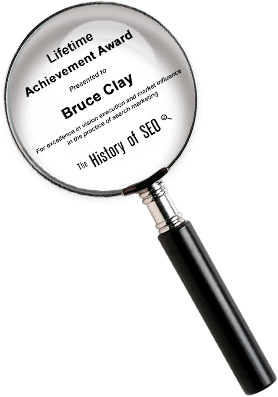 Check out our 23-Point SEO Checklist(http://bit.ly/1awVKzY) for guidance on where to place keywords, and other optimization factors to double-check. Remember, there’s only room for 10 links on page one, so in order for you to claim one of those 10 spots your optimization has to be better than someone else’s.